Fiction – hardcover; Picador; 378 pages; 2013. Review copy courtesy of the publisher. I may possibly be the last person in the world to read Hannah Kent’s extraordinary debut novel, Burial Rites, which has been lauded far and wide and nominated for almost every prize going since publication last year. It is one of those rare Australian novels that has achieved international acclaim — and with good reason. This is a universal tale of what it is like to be in the wrong place at the wrong time, with no recourse to proper justice, and it tells the story in such a frank and interesting way that it is difficult to put down. I read it in a matter of days. Set in Iceland in 1829, the book is based on a true story, as the author explains in her note at the end: “Agnes Magnúsdóttir was the last person to be executed in Iceland, convicted for her role in the murders of Natan Ketilsson and Pétur Jónsson on the night between the 13th and 14th of March 1828, at Illugastadir, on the Vatnsnes Peninsula, North Iceland.” Interspersed with real letters and court documents, the narrative fictionalises the events leading up to the murders and beyond. When the book opens we meet Agnes almost a year after she has been sentenced to death by beheading. She has been sent to the north to work her final months on a farm owned by the District Officer, his wife Magrét and two daughters, Lauga and Steina, all of whom regard her with suspicion and distrust. Allowed access to a spiritual adviser to prepare her for “her meeting with Our Lord”, she requests that Assistant Reverend Thorvardur Jónsson, a young priest she met in passing years earlier, take on this role. But it is a task he is ill-equipped to handle. Kent sets up her story nicely with a triumvirate of characters — a convicted killer, a family that doesn’t trust her, and a man of religion — but what happens next isn’t really what you might expect. During her time on the farm, Agnes changes: she grows in confidence, is less fearful of the future and begins to remember incidents from her past, which are told flashback style (in the first person). But she also has a profound effect on the people with whom she must now live and work among — they begin to see her in a new light, particularly when she tentatively opens up and tells her sometimes shocking, always surprising version of events. What I loved most about Kent’s story is the effortless way it is told. Her prose style is clean and compelling, although the language — particularly the idioms and some of the dialogue — does occasionally feel too contemporary for the 19th century. But the way in which the narrative builds and switches between third person (for the District Officer’s family and the reverend) and first person (for Agnes) is one of the book’s great strengths. Not only does it build momentum and provide insights into all of the characters thoughts, it gives the author an effective vehicle for dramatising what happened on the fateful night through the eyes of the person charged with the crime. Perhaps the only real problem I had with this novel (and I suspect this is unique to me) is that I felt like I’d read it all before — it did not feel as fresh or as original as other reviewers have stated. But I suspect that’s because I’ve spent the best part of 10 years working my way through Arnuldur Indridason’s Reykjavik series. While his novels are set in Iceland in contemporary times, many of them focus on historical crimes, and they’re not dissimilar to Agnes’ situation. 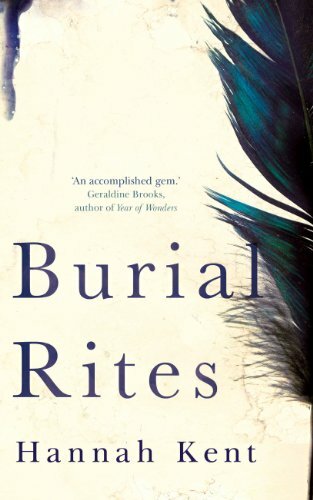 That said Burial Rites is a great read — a proper page-turner with believable characters, a compelling plot that is deftly handled, and a narrative that “zips along” (as a 2011 Booker judge might want to say). It is an incredibly assured debut and it will be interesting to see what Kent comes up with next because for sheer audaciousness — and attention grabbing marketability — this one is going to be hard to top. I will be the last one ;)But I will read it! Hmm, though I too gave it three stars (on Goodreads) I think you liked it more than me. I agree it is compelling and very readable, but I found the blend of Olde Worlde formality and modern idiom really distracting, and the flipping between first and third person – logical at first – started to feel largely redundant in the second half of the novel when it could just as easily (with a few “what I didn’t tell the Reverend”s) all been told in Agnes’s voice. And although I appreciate Agnes is literate, well-versed in the sagas, and lived in a time where oral storytelling would have been something people were more skilled at, her story as she speaks it to the Reverend and to Margrét didn’t sound like speech – it’s too honed and crafted (nobody actually says “so-and-so exclaimed”, that’s something you write). Still, I did enjoy the story, but for me it was more of a “promising debut” than the masterpiece some reviews seem to have hailed it as. You’ve summed up how I felt about the language better than I did: the clash between Olde Worlde formality and modern idiom grates, and I had to just try to ignore it. But I think the storytelling makes up for it. If the story wasn’t compelling I may have actually abandoned the book because of the language problems. And I also agree with your final sentence: it’s a promising debut, not a masterpiece. To be honest, calling a debut a masterpiece (even if it is a masterpiece) is like creating an albatross to hang around the author’s neck, because how on earth can they ever trump it? In fact, I’m going to try reviewing Oz and NZ books read in French on my French blog + the ones read in English on my other blog (‘The Night Guest’ will be the exception and will be reviewed twice). Of course, I won’t bother you with links of reviews written in French (unless you insist ;). I claim the space of last to read this! I was thinking after reading yiur review that it would be a definite but then I saw the comment about the oddity of the language and that has given me pause for thought. The modern idioms etc did annoy me to begin with, but I soon got caught up in the story, so I wouldn’t let it put you off. I had the opposite reaction to the switch between third person and first person to be rather cumbersome. Perhaps it would have been easier to follow had I been given forewarning of such switches — a new chapter or a header. Although, I did find the switch helped the narrative later on as details of the night in question were recalled by Agnes and explained to the reader. I agree, though, that the story itself felt familiar. I have not read books set in Iceland to the same extent that you have, but there was something about the story that made me wonder if I had heard about it before.